God bless the USA! At Menke’s we’re experts on foreign cars of all kinds, but we keep a special place in our hearts for good old fashioned American craftsmanship and automotive design. From the Ford Model T to the Mustang, America has always been known for its love of cars, and there’s nothing quite like hitting the open road and touring the countryside in an all-American beauty. At least until it stops running. That’s when Menke’s gets to work. We service over twenty-five kinds of American cars, and each one is special. From fast Fords to smooth Saturns, we have over two hundred and fifty years of combined experience working on the great American automobile. At this point, the ASE certified technicians at Menke’s have seen just about everything that can go wrong with an American car, and in every case, we’ve fixed it. With computer assisted engine analysis and quarterly training updates on the newest in diagnostic technology, we have the technology and expertise to keep Southern Indiana running fast and free on the road. It’s easy for us to say that Menke’s is the best, but don’t just take our word for it, check our credentials. Menke’s has been recognized on a national level as Motor Age magazine’s “top shop” out of 165,000 surveyed American garages. Add on an Angie’s List Super Service award, the ASE Blue Seal of Excellence, and membership in the American Automotive Association, and it’s no wonder that we’re the only AAA Approved Auto Repair Facility in Southern Indiana. With competitive pricing and a long tradition of customer approval, there’s not much more that you can ask from your repair shop. We think it’s pretty clear that we’re good at fixing cars, but our business doesn’t stop there. When it comes to customer service, our policy is always “satisfaction guaranteed.” We’ve done everything we can to make sure that you leave happy. That means that not only do we offer free loaner cars while your car is in the garage, but we’ve also created the most comfortable waiting area you’ve ever seen. Get your frill fill with free wifi, full cable, and a homelike environment so plush that you may not want to leave. 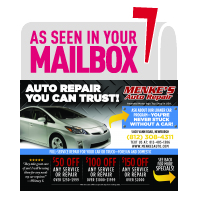 Stop in today and find out why Menke’s is leading the way in automotive repair!